You can see in which institution(s) you are a member when you go to Groups → Institution membership. You may be able to leave your current institution and join other institutions if they allow self-registration. If you cannot leave your institution, you must ask your institution administrator to remove you. Leaving an institution does not mean that your account is deleted. You keep your content and portfolio pages when you move from one institution to another as long as you have your account. Institution administrators should not delete your account when they want to remove you from their institution. Memberships: Here you see to which institution(s) you belong. Click the Leave institution button to remove yourself from an institution. If you do not see this button next to an institution, you cannot remove yourself but must ask an institution administrator to do so. Requests: If you have already requested membership in an institution, it will be listed here. You must wait for an institution administrator to approve your request. If you wish to cancel a request, click the Cancel request button. 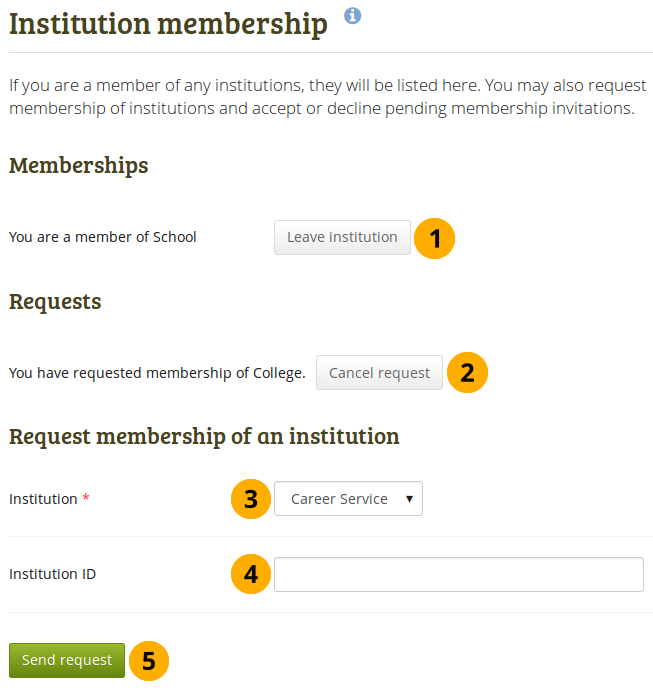 Request membership of an institution: Choose the institution from the drop-down menu that you wish to join. You only see institutions that allow self-registration. You can provide an ID if you have one for this institution, but that is optional. Click the Send request button, and the institution administrator is notified of your request and will deal with it.